Small trees and shrubs, especially the ones that flower, such as crabapples, lilacs and hydrangeas, are the backbone of a beautiful home landscape. Trees grace your property with added height, color and texture all year long – flowers in spring or summer and attractive leaves and berries or good fall color. In winter, woody plants, especially evergreens, add shape and texture to bare yards. The trend is not to segregate flowers in their own beds, but to plant what’s called a “mixed border”. 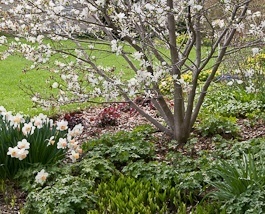 In a mixed border small flowering trees – crab apple trees or magnolias and shrubs such as rhododendrons – join perennials in a planting bed that’s attractive all season. This is practical for today’s smaller properties, where you really don’t have enough space for separate beds of shrubs and flowers. 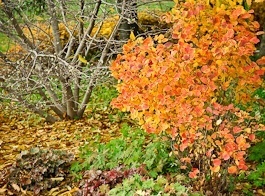 Trees and shrubs are a low-maintenance way to add all-season color and texture too. If you choose carefully, they’ll your easiest-care plants. A garden populated with one of this and one of that tends to look jumbled and in need of something to pull it all together. That’s why designers recommend planting all except some of the largest stand-alone or specimen plants in odd-numbered groups of three or five. Make sure the moisture, soil and sunlight requirements of your chosen tree or shrub match the conditions in your yard. For example, woody plants that grow best in moist situations will do poorly in dry soil areas if they never get watered. Consider the mature size and shape of the shrubs or trees you want to plant. If there’s a major mistake people make in their gardens, it’s that they seem to forget that plants grow! And then they spend way too much time pruning (often hacking and mutilating) woody plants like forsythia to try to make them smaller. To make your gardening easier and more pleasurable in the long run, take some time to research right-sized plants before buying. Don’t just plant what the neighbors have. Unfortunately, most neighborhoods are filled with the same old woody plants. There’s a wealth of gorgeous shrubs, as well as flowering and fruit trees to choose from, so it shouldn’t be too hard to create variety in your garden. Garden writer Pam Duthie has an excellent book on choosing interesting and garden-worthy flowering shrubs and small trees.